Seeing a bald eagle swim is not a common sight on our wildlife tours maybe once or twice a summer. 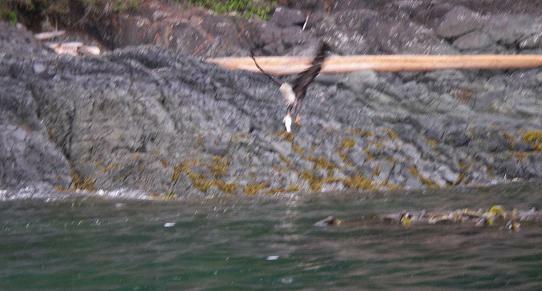 But this morning we saw three take a salmon to shore. An eagle will catch a fish in their talon that is too heavy for them to carry and they will swim to shore with it so they can eat it. They use a butterfly like swim stroke. 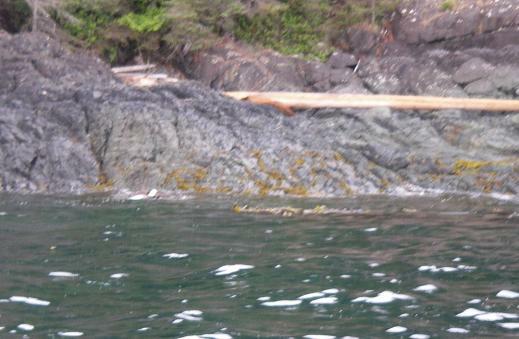 In the first photo it is almost to the shore and the second show the eagle lifting the fish further up the shore. In this case its mate came down and took the salmon, as it was to exhausted to fight. The happy ending was that it did get to share the fish once it recovered. In a good spyhop the orca / killer whale has about half of it’s body out of the water. 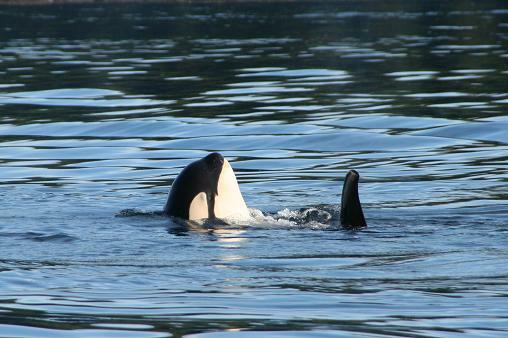 This is more of an orca backstroke where it was passing the boat and rolled over and stuck it’s head out of the water. The description of what is happening is not important because the picture is interesting and unique. We have had 4 great days here in Minstrel Island. Thanks to all of you to provide us this beautiful bears, eagles and whales experience, Thank especially Angus for his great guidance and explaining all the wildlife to us “city people”. Also thank to John and Cathy for the great hospitality and the wonderful cooking as a 4* restaurant. We will certainly recommend this to our friends.